This is the sales brochure for the 1964 CSS package. 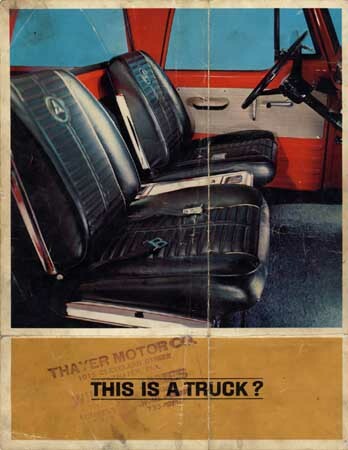 This is the brochure my dad, Hobe Simons, used to order his truck from. He decided he wanted bench seat instead of the buckets. It was supposed to come with the stripes but it did come from the factory that way. THE NEW CUSTOM SPORTS SPECIAL! It's as rugged as any Dodge pickup. But it has plush features you've never seen in a Dodge truck before. Black vinyl - upholstered bucket seats to match any all-out sports car's. Plush carpeting that extends from the fire wall to the top of the gas tank behind the seats. Dual armrests and sun visors. An easy-to-read instrument arrangement. And a console between the two seats, equiped with a cigaret lighter, ash tray, coutesy map light and extra storage space. Outside, the Custom Sports Special has a chrome grille, bumper and roof mouldings, and a set of sports car racing stripes extending over the roof and hood. Under the hood this Dodge offers you any kind of power from the economical 225 cubic inch Slant Six developing 140 horsepower to the 426 cubic inch Dodge V8 developing a hot 365 horsepower. 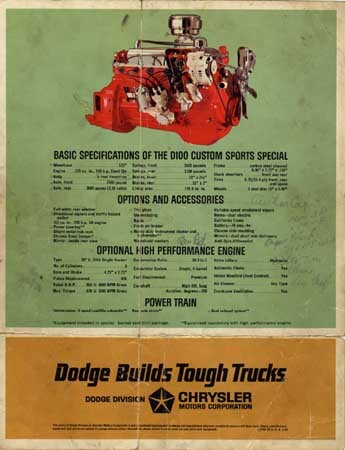 This engine is available in any Dodge D-100 pickup with a 122-inch wheelbase, either Sweptline or Utiline. To put your power to the best use, you have a choice of three transmissions. there's a three-speed manual with a column shift, a four-speed manual with synchromesh on 3rd and 4th and a floor shift, and a three-speed pushbutton automatic. The automatic transmission, rear axle struts, power steering, a dual exhaust sytem and heavy-duty front and rear springs are mandatory with the 426 engine, which also requires a special instrument cluster with tachometer. 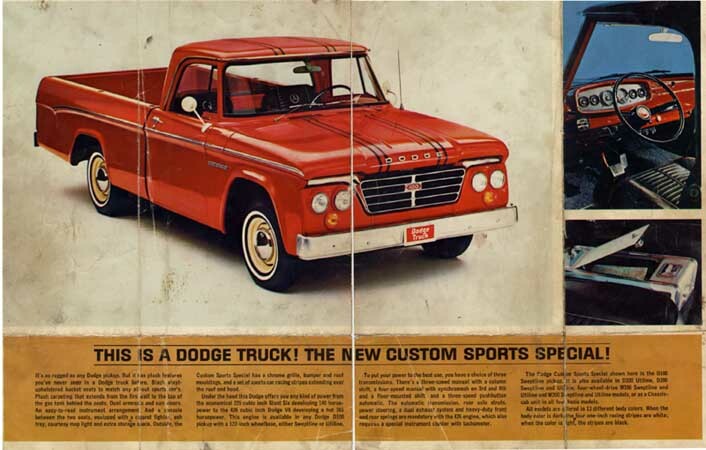 The Dodge Custom Sports Special shown here is the D100 Sweptline pickup. It is also availble in D100 Utiline, D200 Sweptline and Utiline, four-wheel-drive W100 Sweptline and Utiline and W200 Sweptline and Utiline models, or as a Chassis-cab unit in all four basic models. All models are offered in 13 different body colors. When the body color is dark, the four one inch racing stripes are white; when the color is light, the stripes are black. 6.06" x 2.27" x .156"
Wheels...................5 stud disc 15" x 5.00"
Bore and Stroke.....................4.25" x 3.75"
*Equipment included in special bucket seat trim package. **Equipment mandatory with high performance engine.